Saoradh, the republican party viewed as close in thinking to those being blamed for the weekend's bomb attack in Derry, has said "as long as imperialism remains the dominant power there will be women and men willing to engage in revolutionary armed struggle". 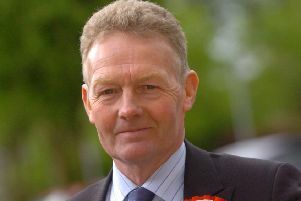 The party, however, has denied having any links to the IRA. In direct response to a query from the 'Journal' a spokesperson for the group said: "Media reports speculate that Saoradh shares a similar political interpretation of the current settlement as those Revolutionary Republicans that targeted a British institution. "Does Saoradh have any links to the IRA? "As is demonstrable from our publicaly available constitution, Saoradh is an autonomous Revolutionary Socialist Party that has collective leadership, transparency, accountability and unrivalled internal democracy. "Saoradh does not or will not come under the control or influence of any other organisation, armed or otherwise." It said the release of a statement by the group in the minutes after the bomb attack on Saturday that speculated that it may have been planted by people seeking to commemorate the Soloheadbeg ambush that commenced the Irish War of Independence on January 21, 1919, was coincidental. "Media reports also wrongly misinterpreted a Saoradh statement released in the aftermath of Saturday's attack. The statement merely pointed out that the revolutionary attack on a British institution happened on the centenary of Soloheadbeg and that 100 years on we’re still partitioned," the group said. The 'Journal' put it to Saoradh that almost all politicians locally and nationally, as well as trade unionists, businesses, churches, and others, described the events of the weekend and Monday as reckless, disruptive and undemocratic. It responded: "Whilst constitutional Nationalists, men of cloth and former Republicans condemn the actions of Republican Revolutionaries, Saoradh takes into consideration the wider aspect of the current political sphere. "With that being said Saoradh recognise the historical and contemporary realpolitik that demonstrates that as long as imperialism remains the dominant power there will be women and men willing to engage in revolutionary armed struggle." Saoradh said it would not be condemning those responsible for Saturday's bomb attack. "The policy put in place by former Republicans of criminalising those who do not agree with the current political dimension hasn’t gone unnoticed by those within our communities," it said. The party also claimed that several of its members were among those arrested by detectives investigating the bomb. All of those arrested have since been released unconditionally. "Over the course of the past number of days the Revolutionary Republican Party, Saoradh, have been targeted by British Crown Forces with seven members detained following heavy handed raids lasting several hours at a time. All seven have now been released unconditionally. "The reason behind these futile attacks is simple. Saoradh are a thorn in the side of the British Establishment and as an anti agreement party have been the focus of British Crown Force harassment. Saoradh are a revolutionary Socialist Party and as such we are engaged in social and working class community based activity with a strategic imperative of preparing and organising Saoradh for a successful revolution," the group stated. The party went on to claim that it was being targeted by political opponents that want to "break revolutionary politics". "Furthermore, as these raids continue to happen, those who have been elected on the back of Republicanism sit in pro establishment talking shops and bury their proverbial heads in the sand as they watch our communities being destroyed by an unwanted occupying force. "It would seem British Crown Forces and their lackies are determined to break revolutionary politics in this city. The continuous harassment hasn’t worked in the past and it won’t work in the future. Saoradh have been to the fore in developing Republican Socialist links via popular assemblies and this clearly unnerves our British occupiers."